What Plants Are Native to Russia? Now that I've shown you how to grow German chamomile, it's time to harvest it and put it to good use. Here's how. Plan on harvesting chamomile in the morning sunlight after all the dew is gone. The plant should be completely dry, The flower part, petals and all, is what you are after. Flowers tend to open up in the morning and will close up when the sun begins to go down. Pinch the flowers off at the stem or cut with gardening shears just below the flower head. Pinching the flowers will allow regrowth of the plant pretty quickly. Find a warm area in your house or garage. Place the drying screen inside with the chamomile intact. 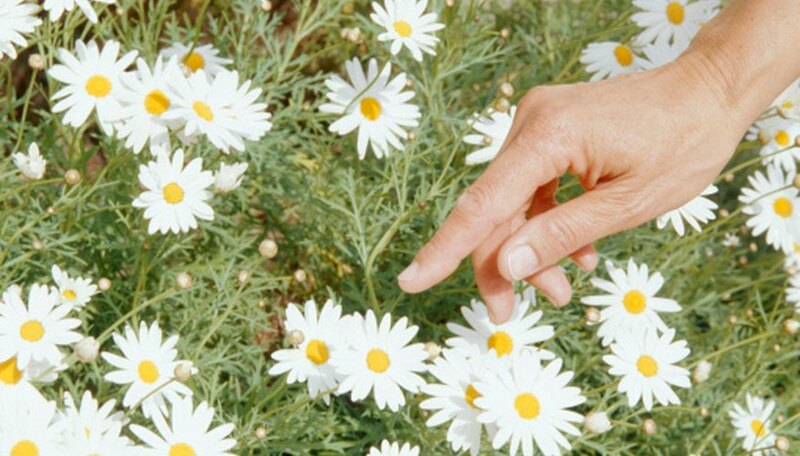 Make sure there is no moisture present and keep the chamomile out of sunlight. 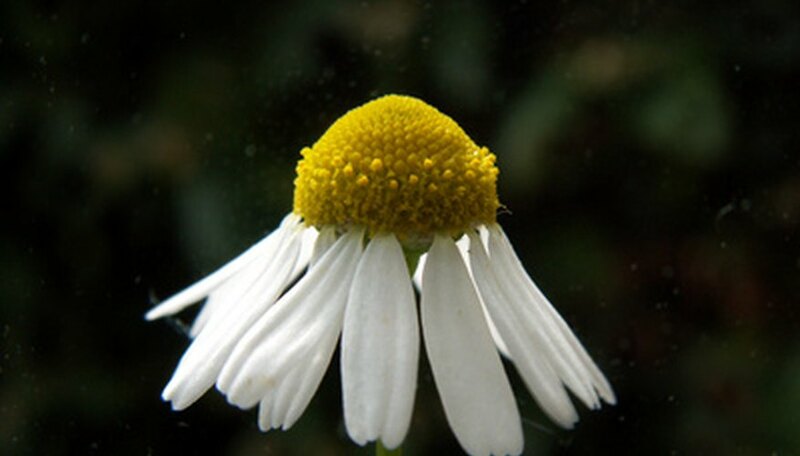 Check the chamomile regularly to see whether it is dried. Place the chamomile in airtight glass containers and keep out of sunlight. It is best not to break apart the flower head until you are ready to use it. Keep as much of it intact as possible. Fill a 1-foot diameter or larger container with general purpose potting compost. Choose a container with plenty of drainage holes. Sow the seeds directly on the soil surface. Use more seeds than needed plants to make up for those that don't germinate. Place in a warm area with plenty of natural sunshine to germinate within 14 days. Keep the soil moist but not soggy. Thin out seedlings to 2 inches apart once they develop their second set of true leaves. Apply a general purpose fertilizer monthly during the spring and summer growing season. Harvest flowers when at the height of their bloom by snipping them off. Place them on a cookie sheet or tray in a cool, dark area to dry for use in teas. Clip chamomile flowers when they are in full bloom or just begining to open. Cut the flower so at least 12 inches of stem and leaves remain. Spread a clean sheet on the ground if drying chamomile flowers for tea production. Tie the flowers into a bundle using soft cotton twine and hang upside down in a sunny, warm location over the sheet. The flower petals and leaves will fall to the sheet below when dried. To dry the flowers intact for dried flower bouquets, spread the flowers out on a flat screen. Place the screen in a sunny, warm location to dry where the flowers receive air circulation above and below the screen. Drying takes two to four weeks. Gather the leaves and flower petals from the sheet. Place in a jar with a lid and put in a cool, dry place for use as tea. Gather the dried flower heads, stems and leaves from the screen and use as a dried bouquet. Most often associated with a relaxing cup of hot tea, chamomile (Matricaria recutita) is Russia's national flower. Known for its fruity fragrance, it is member of the daisy family and native to western Asia. According to e-Floras.org, chamomile over time has been used as a remedy for such ailments as hysteria and nervous diseases, gangrene and typhoid. It's also been combined with bittersweet to treat bruises, sprains, calluses and corns. According to the International Society of Horticultural Science publication, “Collection of Rhododendrons in Russia,” the region claims 10 species and 2 subspecies of native rhododendrons. They are widely grown in botanical gardens throughout Russia. Most of these are deciduous, given climate climate conditions. 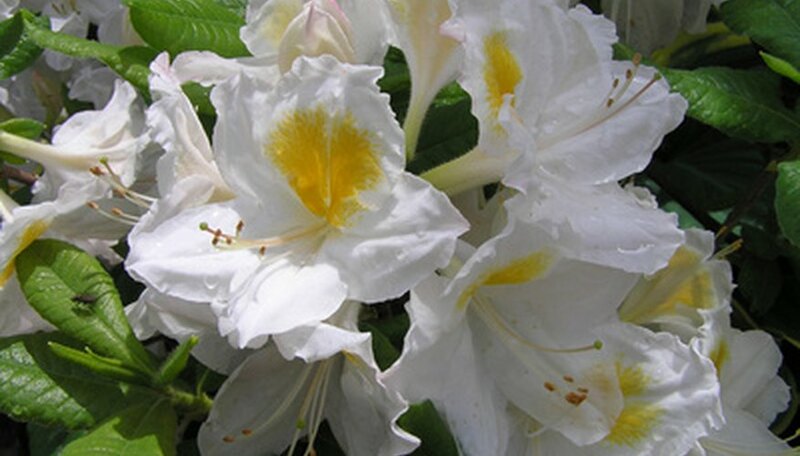 The ISHS states that the most popular species currently grown in Russia include Rhododendron catawbiense Michx., Rh. maximum L., Rh. brachycarpum D. Don., Rh. smirnowii Trautv. Several varieties of iris commonly seen in western gardens call Russia their native habitat. The region claims at least 60 species in all. Perhaps the most recognizable Russian native is Iris siberica, the Siberian iris. Various cultivars are widely popular in gardens throughout the U.S., featuring narrow leaves and several flower colors. 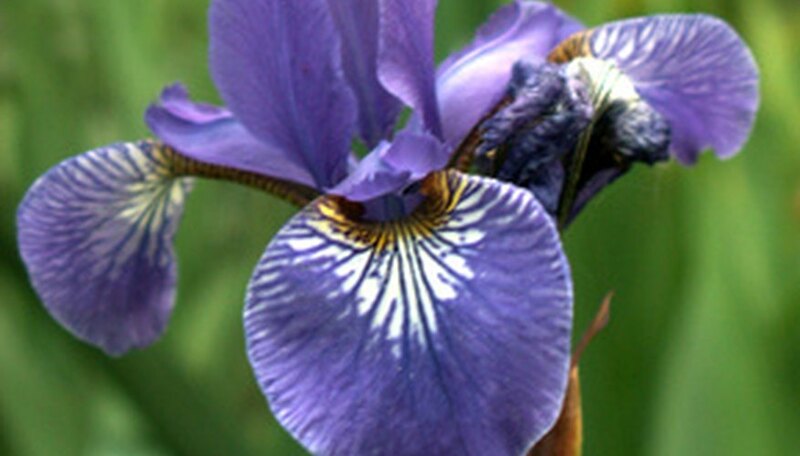 The Siberian iris features two to three groups of white or violet petals. Choose a site with full sun (afternoon shade in southern areas) and well-drained, fertile soil. If planting from seeds, plant directly into the ground in the spring. With your trowel, smooth out the soil and disperse the seeds evenly. Cover with a thin layer of soil and water. Water the seedlings regularly until well-established. In the spring, after the last frost, you can plant container-grown feverfew. Dig a hole roughly twice the size of the plant's base and place it in the hole. Fill back with soil, making sure there aren't any air pockets. Water generously. Plants should be spaced 1 to 2 feet apart. During the summer months, deadhead any spent flowers by pinching them off the stem with your fingers. Feverfew will self-sow, so leaving a few flowers behind in the fall will allow them to go seed and you'll have new plants come spring. To protect your feverfew over the winter months, place mulch over and around the plant in the fall. This can be wood chips, grass clippings or even pine branches. This is one of the herbs the world loves best. 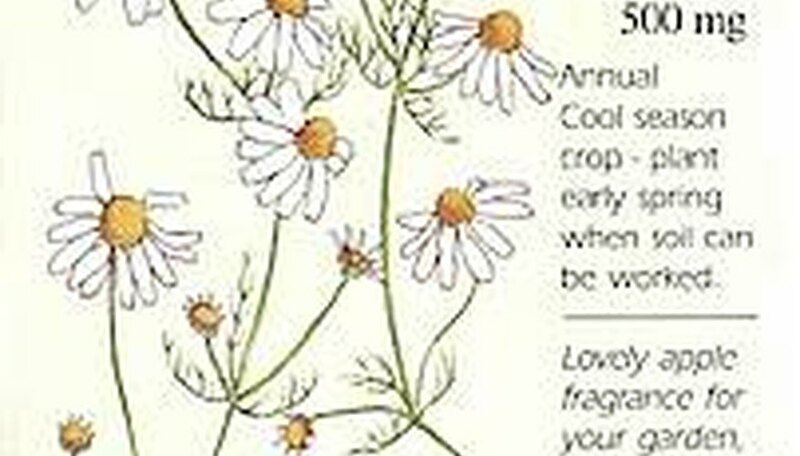 Chamomile, with its wonderful fragrance, is a nice addition to your flower or herb garden. Herbs are reputed to be excellent companion crops. Old-timers plant chamomile with cucumbers and onions to enhance their growth. Makes a soothing tea. Drought tolerant and suitable for containers. When to Sow Outside: Spring, as early as the soil can be worked. When to Sow Inside: Ten weeks before last frost. Thinning: When 1/2" tall, thin to 6" apart.